Caroline Gleich is a Utah-based professional ski mountaineer who has designed a lifestyle out of her love of the extreme outdoors. She is tireless in her pursuits of human-powered adventure. Caroline uses her success as a professional athlete as a platform to inspire those around her to live sustainably. 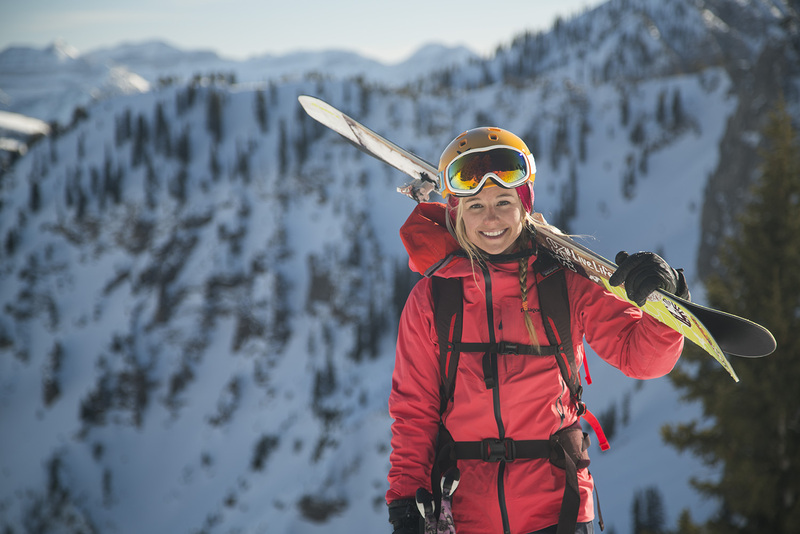 An avid environmental activist and Patagonia snowsports ambassador, Caroline works with non-profit organizations like Protect Our Winters, HEAL Utah and the Winter Wildlands Alliance, fighting for the preservation of the alpine regions that she lives for. Conscious Connection: Caroline, thanks so much for speaking with me today. Can you tell me about what initially drew you to the mountain lifestyle? Caroline Gleich: As a child I’d go on ski vacations to Utah or I’d go on backpacking trips in the summer and we’d visit these beautiful alpine places. I think it was the closeness that I felt with my family when I was there. That presence of mind and that closeness, the belonging, I think that was a big part of it. Conscious Connection: What kind of mentality does that put you in and how does that help drive you to continue to push the boundaries of the sport? Caroline Gleich: There’s a certain amount of vulnerability that you put yourself in when you commit to doing certain kinds of routes with a partner. You can look at maps, you can look at Google Earth, but a lot of times you just have to figure things out as you go along and accept a certain amount of uncertainty. Being in that vulnerable position strips away a lot of the defenses that we have. It allows you to have a real connection with people. You have to put aside any differences in order to adapt and overcome the situation. That’s one of the parts of what I do that I most enjoy. Conscious Connection: You emphasize human power in skiing. How does that reliance on your partner play out? Caroline Gleich: You do have to be kind of careful about the partners that you pick. I mean, you don’t know exactly how it will play out. But I think it’s one of the best things in the world. It takes a lot of preparation, it takes the right conditions, the right weather. But if you can find those opportunities, I think it’s one of the best experiences in life. It allows you to learn how to trust people in a really deep way. Conscious Connection: Over the years you’ve suffered some loss in the mountains. How has that impacted your life and how have these experiences have helped to drive you forward? Caroline Gleich: Losing my half-brother when I was 15 was really traumatic for me. Seeing the shock it sent through my family made me really cautious about risk, and how I went about pursuing my passion of mountaineering in general. It’s not really something that you overcome, the fear and those feelings of uncertainty. It’s always with me in a way. I don’t want to put myself at too much risk. I couldn’t risk doing that to my parents, having seen them go through that loss. The mountain will always be there another day. It’s okay to come back and do it when you’re ready. Because if you make a bad call, an error can be lethal. Conscious Connection: I think that is part of why you’re so successful. You’re willing to put in the time to do it right. Caroline Gleich: And it was something that I had to really work for and earn myself. I still always see myself as a student of the mountain, and I think that humility goes a long way in my career and in life in general. I try not to get too cocky or overconfident, no matter how much training I have. Conscious Connection: Can you talk a little bit about your mentality, and how that’s impacted the success you’ve had so far? Caroline Gleich: To share an experience, that’s something that I really value. To balance the thinking mind and the feeling heart, that’s always been a big challenge for me. I’ve been trying to learn how to trust my heart and intuition. Because I think it’s easy to over-rationalize and overthink things. I’ve been really working on my emotional intelligence. Conscious Connection: As a high-performance athlete, you need to maintain this super high-performance lifestyle. How do you maintain that balance? Caroline Gleich: Early on in my career I did tons of yoga and a lot of meditation, and then as I became more focused on my mountaineering goals I stopped doing as much yoga. I have been working to reincorporate that into my training. A career as a professional athlete is pretty stressful a lot of times. We put a lot of pressure on ourselves to reach our potential and fulfill our goals. The way that stress affects your body is crazy. Losing Liz [Daley] was really hard for me. So lately I’ve been trying to take a step back, chill out a little bit more about the training, and get back to having a more lighthearted approach to things. Yoga’s been a big part of that. Conscious Connection: Could you talk more about your fitness and nutrition regimen and how it supports this mountain lifestyle? Caroline Gleich: The training is the easy part, but the hard part is getting the body to fully recover so that you can train again. I try to eat a lot of fruit and vegetables and then whatever else my body is craving, whether it’s donuts, or a hamburger, or a big salad. Everything’s okay, I think, in moderation. I keep it varied. I don’t try to deprive myself of anything. I think your body has a craving for a reason, as long as you can listen to your body. Conscious Connection: Tell me about your goal to complete all the lines in the Chuting Gallery? What have been some challenges? Caroline Gleich: That project is really near and dear to my heart. I can see a lot of those mountains from my house. I’ve done a lot of projects internationally and I love doing that, but there’s something more deep and fulfilling about a project that’s close to home. I skied my 70th line yesterday. I have about 20 lines left. One thing that’s made the project really challenging is climate change. It used to be that everything would fill in and you’d have a long window. But in the past couple of years the entrances and exits to the lines melt out so you end up walking for hours. The winters just aren’t the same as they used to be when [The Chuting Gallery] was written in 1998. Conscious Connection: How has the work that you’re doing Protect Our Winters and other environmental organizations inspired other people to make an impact? Caroline Gleich: We’re professional athletes. Our careers are based on passion. I try to win people over with heart and emotion. I think it’s a more effective way of affecting policy and change. With Protect Our Winters, we do a lot of lobbying. Effective lobbying is about finding common ground. A lot of people have a shared love of the outdoors, especially skiing. So we can get meetings with even the most right-winged conservatives and we can find common ground over that. Conscious Connection: As someone who’s achieved success in your own life and who continues to strive to make an impact, what would you say is your best piece of advice for our readers? Caroline Gleich: To find that spark, whatever it is that makes you come alive. I think that when people are living their fullest expression of themselves, that’s when they can be of the greatest benefit to the world.